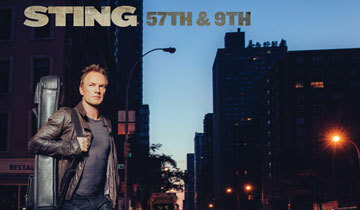 Prince, David Bowie, climate change and the refugee crisis spark Sting’s first record in 17 years. “57th & 9th,” named after the intersection the 64-year-old crosses every day to get to the studio, was recorded in just four months and features his touring drummer Vinnie Colaiuta and guitarist Dominic Miller, and Jerry Fuentes and Diego Navaira of the Tex Mex band the Last Bandoleros. Metro meets The Police’s former frontman at Cherrytree Music Company in Beverly Hills to chat about the ever-changing musicscape, social issues and the cold tingle he got while penning one of the songs for his new album, which drops on November 11. Your new album sits firmly in the pop-rock genre, but did you consider going offbeat and doing an electronic record? [Laughs] An intrinsic part of a musician’s life is to create the wow factor, which comes down to the instruments as well as what your songs say. For example, in recent years, I have made records that had a more esoteric touch simply for the fact that a theme caught my attention and I was curious to learn new things. Perhaps people assume that I will continue doing the same, which they may or may not like. But I was clear that with this album I wanted to do something new and surprise people with something different. I wanted the public to hear something from me that they were not anticipating. Certainly, I could have also surprised them with an electronic music record [laughs]. This album was something spontaneous, recorded very quickly and done with friends. Every day, I went to the studio in New York where I met with my guys and we would work. When I got back home I would try to give more shape to what we had done, find a story and turn it into song. For me, the experience was to enjoy myself. Is it easy to find inspiration when you record an album? It is very difficult. The first song called "I Can’t Stop Thinking About You" is a song about obsession. It’s really about a writer who sits in front of a blank sheet that looks like a snowy field. Your job as a writer is to write something and dig to find something – a muse, an idea and something to inspire you. The dilemma for any writer is to find inspiration. Music for me flows much faster and I get it in a more natural way, but the inspiration to write the lyrics of the song comes from a much more mysterious place that I really do not understand, but I know if I have patience and discipline it will come. In a way, I want to find myself in a somewhat uncomfortable situation because my life, as you can imagine, is very privileged. Where I live in New York, I have a terrace and during winter when it is freezing cold, below zero degrees, I lock myself out with my paper, my pen and my music and do not enter the house until the song is finished. It is a way of inspiring me and forcing myself to write. I did this for many days. I was terribly cold and so my first song refers to that. What direction is the music industry heading and what changes have you seen since you started? That is a very difficult question to answer. I honestly have no idea. I don’t even know where my own will go in the future [laughs]. But do you think today musicians can still be successful without the talent that was required in your heyday? I’d prefer not to comment on that issue. I believe that music is very important for almost everyone. I do believe that today there are people with more talent than when I started. What makes things complicated now and what has changed from when I began is how music is delivered. Perhaps "streaming" is the right way. The problem is how to get paid. But I have confidence that these problems will be solved even though it is now a bit confusing. You have to think that music is something very important for virtually everyone. In my day, music was everything; today there are many more distractions. There are many other things that people are interested in like video games – Pokemon [laughs]. But still music remains a part of us all. I am optimistic that the music industry will continue to find very talented people. Do you have a love-hate relationship with music? It is definitely an obsession. Sometimes it can be a curse. A musician has to analyze music. If you hear it in an elevator or in a supermarket and you don’t like it, you can’t disconnect because you're constantly analyzing it. So I very much appreciate silence and concentrate on what I do. I’m not sure if you saw the article that was written on a scan of my brain, which I had at the University of Montreal. First of all they found a brain, which is great [laughs]. Basically they put on different music, some I liked and some I didn’t. The conclusion was that musicians listen with more parts of the brain than other people. So we're cursed and blessed at the same time. What would be your favorite song from your new work, if you have one? If we consider the surprise factor, the most different one is “Petrolhead” because it is very rock and roll. I think it will surprise people. On the other hand there is another one that I think is very sensitive which is “Heading South on the Great North Road,” which is a bit where I come from and why I went in search of a better life. In this sense it is related to another song called “Inshallah” that relatively speaking is also about people – refugees – seeking a better life. I think all people in some way are refugees. Not at the level of the people of Syria, obviously, because they are in imminent danger, but in the sense that no matter where you live, your ancestors always come from elsewhere. We must bear this in mind. The flow of refugees may change in the future; perhaps we will have to seek refuge and hope that others will accept us and will not put obstacles in our way. I'm not trying to give it any kind of political solution, but it is something that must be treated gently and not as something abstract that does not affect us. We have to think of a face, a family and not just in numbers. I have no answer but we have to solve it because it will not go away. The reasons for migration are now mainly due to war and poverty, but soon climate change will also affect it so it is important to get to work and together try to fix it. You've always been greatly involved with social issues. Do you think the obsession with money, power and achieving a certain standard of living is causing the world to become increasingly unjust? We live in a world where it is difficult to live without economy. We need to exchange goods or services but we need an honest sense of community. You sell what you produce to people who need it and have prospective buyers. It is not about a few possessing everything. And therein lies the problem. That must change. Twenty-five years ago, you and your wife founded the Rainforest Foundation Fund to help the Amazon Indians. What work is still being done? Yes, right. In the Matto Grosso we created a legal infrastructure for people who lived there and who had no ability to fight for their rights. Basically defend their rights to the land in which they live, education and maintain their own language. We have recreated this model in 21 countries around the world including Southeast Asia and Africa. We have more projects that are based more on human rights than on nature or the protection of the trees. But my theory has always been that without people that are aware about taking care of nature, we cannot save any trees. The two things are completely united. When we badly exploit our planet, the first to suffer are the poorest. We all have a responsibility on this issue. Movements like vegetarianism also reduce pollution. Definitely. I eat very little meat – almost none. Meat consumption is a huge expenditure of water and pollutes the ozone layer. It is an industry with disastrous consequences for our planet. People should be made aware. Social networks are now a tool that many artists use to promote themselves. How do you use them and what is your opinion of them? I have a Twitter account and a page on Facebook and contribute by uploading information from time to time but I'm not obsessed with it, or spend the whole day watching them. That would make me crazy. If I'm honest, I have a smartphone like almost everyone else, which I use to make a call and then turn it off. I don’t send messages or Whatsapp. It is not easy to contact me because I almost always have it off. Recently we have seen in Britain how people voted yes to Brexit. What is your opinion? I voted for us to stay in the European Union but I can understand why people voted for us to leave. At first people were deceived by both the press and by politicians. But the big mistake was to have a referendum. We elect politicians to make those decisions for us; in referendums people vote almost always based on emotions and that's not good. It must be based on facts and so we have a political system that takes care of it. That is the role of parliament. People voted from an emotion and what they wanted was to kick the government in the face. I am not in favor of referendums – it is not the right way to vote. It was the weapon used by [Adolf] Hitler; it was his favorite tool to get what he wanted. He knew that dealing with basic emotions he could get a lot from people. It is based on fear, hatred and suspicion and a referendum is perfect to channel all this. So when I become King, I will avoid it [laughs]. Just kidding.